The idea for #whatwouldyoucut came from a group head teachers in Cheshire East - one of the country's worst-funded areas in the country, which is set to loose out even more under the government's planned new funding formula. 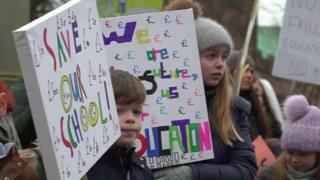 ASCL interim general secretary Malcolm Trobe said: "This campaign shows what is at stake as a result of the education funding crisis. "School leaders have to reduce their budgets significantly. "Smaller budgets mean fewer staff and this impacts on every area of school activity. What would you cut? School concerts? Educational trips? GCSE courses? Mental health support? Sports events?" "The government has protected the core schools budget in real terms since 2010, but the system for distributing that funding across the country is unfair, opaque and outdated." This was why it was bringing forward a new national funding formula, under which half of England's schools will receive a cash boost in 2018-19, it added. One tweet suggested the length of school day could be shortened. The Twitter campaign comes in the run-up to the Budget on Wednesday. Kevin Seaward, an Irish marathon runner and assistant head teacher, was part of the Ireland Olympics team in 2016.